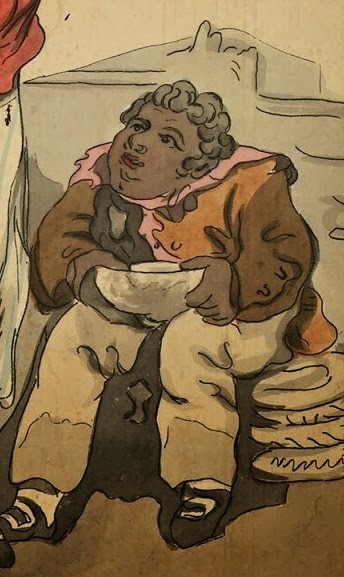 Rowlandson sketched and painted a good number of sailors in the late eighteenth century, though I believe this is the first example I've examined. In this piece, three sailors relax dangerously close to a boom. A large tankard lays beside one, while another cradles his bowl. With such comforts, it's easy to see why these salty chaps make up the Jovial Crew! The sailor on the left (the one with the long pipe between his lips) wears a black round hat turned up on both sides, a solid yellow neckcloth, and a single breasted white waistcoat. His blue jacket has mariner's cuffs, and all buttons are cloth covered. The slops about his legs are an off-white, probably canvas. In the middle stands a proud tar with a red jacket. Though blue is by far the most common in primary source images, red is the easy second. Like his shipmate, this tarpawlin's jacket is single breasted, ending at the waist, with cloth covered buttons and mariner's cuffs, one of which is open. His hat is also a round hat, though not curved up quite so dramatically. The neckcloth is a bit of a mystery to me. At first glance it appears to be striped, but half of it appears black. Is this a pair of neckcloths wound together? Is it striped on one side and black on the other? Was this merely a poor attempt at shading? Regardless, he also wears a single breasted waistcoat of white, with a slight cutaway at the waist. A stick is tucked up under his arm in handsome fashion. This is the first time I've ever seen slops in a patterned fabric! Thin blue stripes run at a slight angle along the length of his slops. Slops were more like glorified aprons than proper breeches, and were meant to protect the more breeches garments beneath. Because they were meant to get dirty, it made little sense to use decorative fabric on them, so this is certainly unusual. At the far right is a sailor of African descent, the first to be featured in this blog. 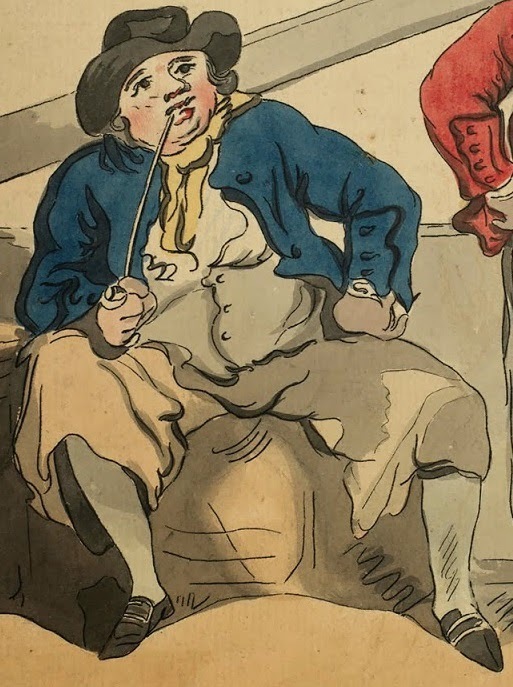 Though doubtless they were present and made up a measurable portion of eighteenth century sailors, a vast majority of primary source images focus on Anglo tars. 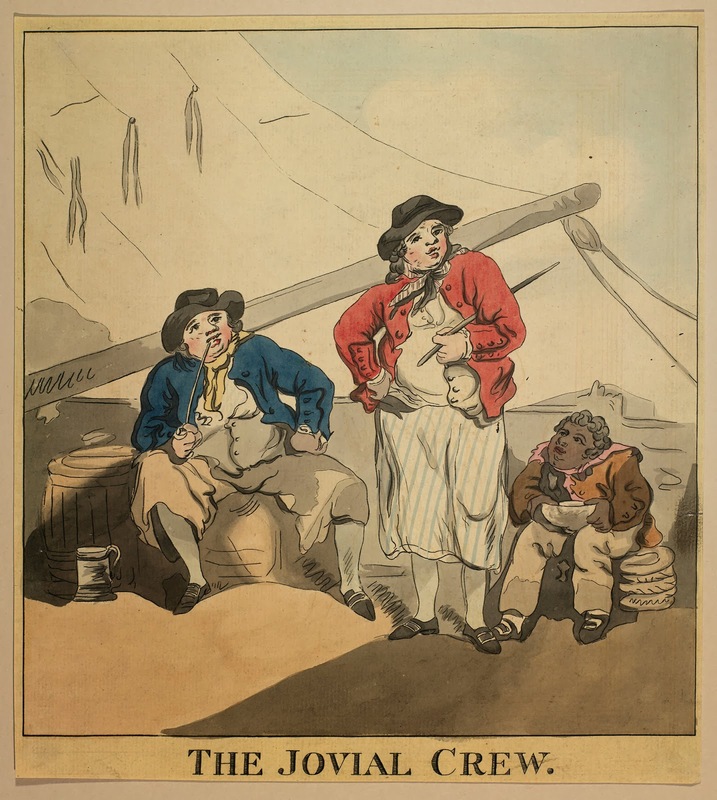 Our seamen here wears a pink or very light red neckcloth, a brown short jacket with cloth covered buttons on his mariner's cuffs, and a pair of trousers. The entire Jovial Crew wear their unkempt hair short, pointed toe shoes, and rectangular buckles.